The new policy allows TSA to concentrate its energies on more serious safety threats, the agency says. WASHINGTON — Airline passengers will be able to carry small knives, souvenir baseball bats, golf clubs and other sports equipment onto planes beginning next month under a policy change announced Tuesday by the head of the Transportation Security Administration. The new policy conforms U.S. security standards to international standards, and allows TSA to concentrate its energies on more serious safety threats, the agency said in a statement. The announcement, made by TSA Administrator John Pistole at an airline industry gathering in New York, drew an immediate outcry from unions representing flight attendants and other airline workers, who said the items are still dangerous in the hands of the wrong passengers. “While we agree that a passenger wielding a small knife or swinging a golf club or hockey stick poses less of a threat to the pilot locked in the cockpit, these are real threats to passengers and flight attendants in the passenger cabin,” the union said in a statement. The policy change was based on a recommendation from an internal TSA working group, which decided the items represented no real danger, said David Castelveter, a spokesman for the agency. The presence on flights of gun-carrying pilots traveling as passengers, federal air marshals and airline crew members trained in self-defense provide additional layers of security to protect against misuse of the items, he said. However, not all flights have federal air marshals or armed pilots onboard. The new policy permits folding knives with blades that are 2.36 inches or less in length and are less than 1/2-inch wide. 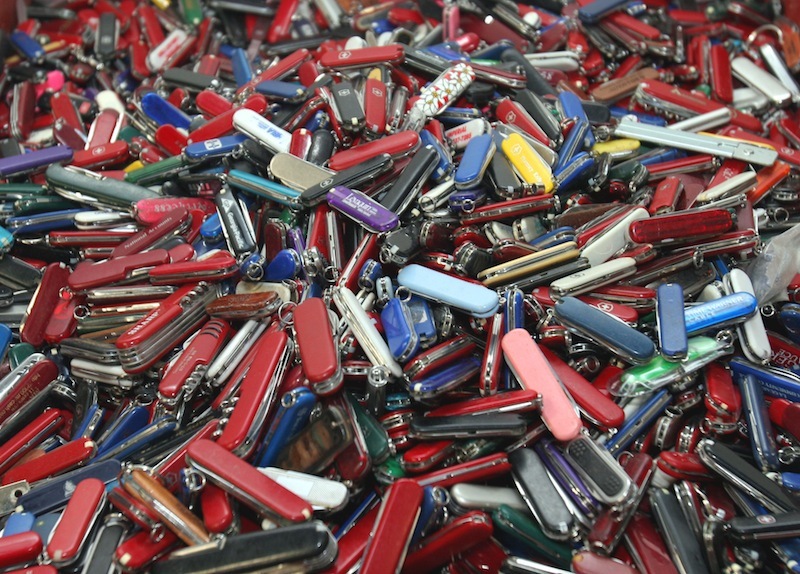 The policy is aimed at allowing passengers to carry pen knives, corkscrews with small blades and other knives. Passengers also will be allowed to bring onboard as part of their carry-on luggage novelty-sized baseball bats less than 24 inches long, toy plastic bats, billiard cues, ski poles, hockey sticks, lacrosse sticks and two golf clubs, the agency said. The policy goes into effect on April 25. Security standards adopted by the International Civil Aviation Organization, a U.N. agency, already call for passengers to be able to carry those items. Those standards are non-binding, but many countries follow them. Box cutters, razor blades and knives that don’t fold or that have molded grip handles will still be prohibited, the TSA said. Reaction to the changes was mostly positive among travelers interviewed Tuesday at Los Angeles International Airport. The items that will be permitted under the new policy don’t present any greater danger than other everyday items that passengers can turn into weapons, aviation security consultant John L. Sullivan said. A pen or a toothbrush can be sharpened into a knife like the “shivs” inmates sometimes make in prisons, he said. Some airlines have returned to using real glassware and silverware in first class, rather than plastic or paper, he noted. Glasses can be broken and used as weapons, he added. Douglas Laird, a former security director at Northwest Airlines and now a security consultant, said the change was long overdue. He said security should focus more on profiling passengers and less on what they’re carrying. “After 9/11, TSA did a lot of things pretty fast without thinking it through. They have better things to do than look for a guy who’s got a 2-inch knife,” he said. There has been a gradual easing of some of the security measures applied to airline passengers after the Sept. 11, 2001 terrorist attacks. In 2005, the TSA changed its policies to allow passengers to carry on airplanes small scissors, knitting needles, tweezers, nail clippers and up to four books of matches. The move came as the agency turned its focus toward keeping explosives off planes, because intelligence officials believed that was the greatest threat to commercial aviation. And in September 2011, the TSA no longer required children 12 years old and under to remove their shoes at airport checkpoints. The agency recently issued new guidelines for travelers 75 years old and older so they can avoid removing shoes and light jackets when they go through airport security checkpoints.